Of course, whether or not you pay a scratcher to prick your skin is a purely personal decision; strangely, however, a generation ago no one (dare I say it?) in their right mind took such a decision, whereas now many perfectly normal people do. If you meet someone with crossbones on their sternum you do not avoid them, as your parents would have done; rather you’d ask, with real or fake admiration, who did this kicky job? I’m not concerned about the diffusion of bad taste, because chacun à son goût. More interesting is the question why this happens. The craze for ink comes in waves. In the 1880s, the Duke of York, later King George V, made tattoos respectable by acquiring one in Japan. In the 20th century, the taste for painful body paintings faded into oblivion, until in the 1990s, it resurfaced, if differently. The other day, I saw a beautiful blonde with an inscription round her left ankle: The nail that sticks out gets hammered down, it read, in Japanese. Since this is a rather hackneyed Japanese proverb which in the event was lifted out of its native context where tattoos are still strongly associated with organized crime, it was quite funny and ingenious. Most tattoos are more run of the mill, making use of stock elements. The same with language. How we express ourselves is based on personal decisions. No one speaks like me. My accent, my choice of words, not to mention the volume and velocity of my prattling. Yet, there is nothing more social than language. A private language, as philosophers found out long ago, is an oxymoron. Language lives by serving a community of at least two. Each word I say makes sense only if validated by another speaker willing to recognize my intention. In this sense a language sets limits; limits to freedom of expression. The community of speakers does not tolerate too much deviance. Our articulations are entirely personal, like the tattoo behind our ear, but there is a strong element of group thinking going on. Language is essentially social. The influence an individual can exercise on it is minimal. We know that even pitch, which seems to be as natural as a finger print and beyond control, is social and changes with time, like fashion. Reducing something as noble as language to the whims of fashion – isn’t that rather frivolous? It isn’t. Expressions like “on fleek” come in and go out of fashion like tattoos, although they are less painful to remove from your repertoire. But you can wait for a long time for the beautiful blonde (or handsome prince) to come along and say something imaginative that will enrich the language. Most people say something “entirely unique and personal” – because others do. They flow with the tide, employing language not to be innovative, but for its other important function, to show that they aren’t deviant, but belong to the fold. Language is a very productive tool that enables us to express new ideas and the same ideas over and over again in ever new ways, but only few blonde ladies (and handsome princes) leave their mark on it when they put it to use. Those who stick out in pathological or otherwise incomprehensible ways get side-lined by not being understood. Only rarely is an individual’s transgressing and bending of the rules accepted as a productive contribution to shaping a language. For the ordinary nail that sticks out gets hammered down, but the silver nail that offers a new hold on things is on “fleek” and revered, in Japan as elsewhere. Featured image credit: “Dictionary” by jwyg. CC BY 2.0 via Flickr. Florian Coulmas is Senior Professor of Sociolinguistics and Japanese Society at the IN-EAST Institute of East Asian Studies, University of Duisburg-Essen. His most recent book concerning Japan, in German, is about Tokyo and ‘the happiness of urban life’. It appeared in 2014 when he left Japan after living there for twenty years. 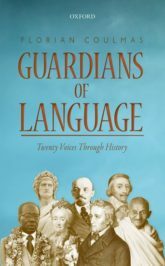 In March this year, he published with OUP Guardians of Language: Twenty Voices through History.